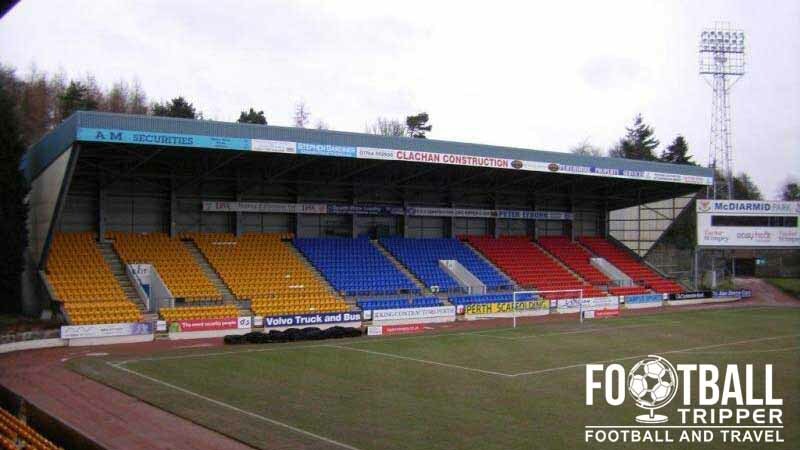 McDiarmid Park is a football stadium located in the central Scottish city of Perth. 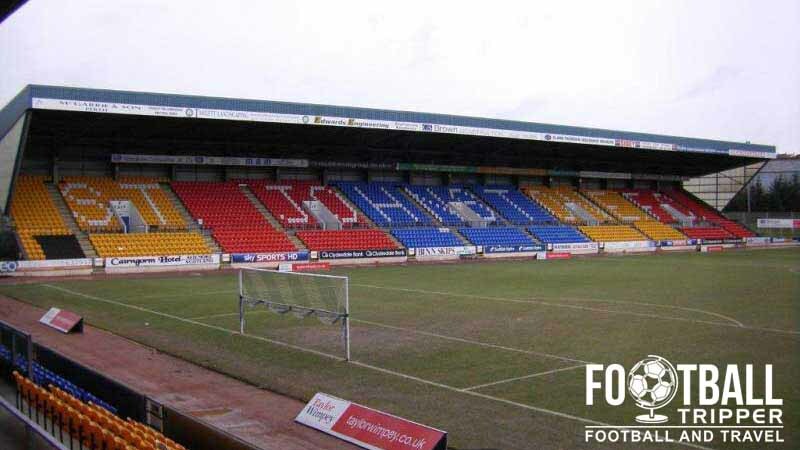 Home to St Johnstone F.C since it opened in 1989, the 10,696 capacity ground initially cost £4.9 million pounds and is also used for Rugby Union Matches. 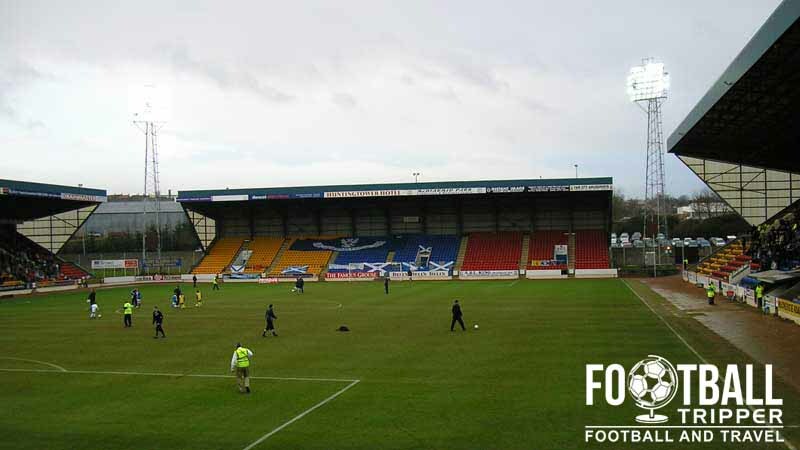 The home ground of St. Johnstone FC was built in remarkably straightforward circumstances that if you read about the same combination of luck happen to your club, you probably wouldn’t believe it. By the early 1980s is was plain to see that the club’s former ground at Muirton Park which first opened in 1924 was falling into a state of disrepair and annual maintenance costs were rising exponentially. Before The Saints had time to assess all of their options including renovation Asda Supermarkets made an offer for the plot of land. Similar to the deal Tesco struck with St. Mirren in 2007, St. Johnstone’s luck continued when local farmer Bruce McDiarmid, who the stadium is named after, agreed to donate approximately 16 acres of land to the club. Saving the ground approximately £400,000 and practically no annual leasing costs, the club made McDiarmid a 20 per cent shareholder with the title of Honorary President which he accepted. The honourable donation of “berry and barley fields” resulted in McDiarmid Park becoming the first purpose built all-seater stadium in the United Kingdom, a recommendation which was set to become enforced across the country after The Ibrox and Hillsborough stadium disasters. With the ground opening approximately four months after the tragic death of 96 fans in Sheffield, Lord Justice Taylor saw fit that he would visit the new ground as part of his investigation into making Britain’s football stadiums safer environments which was published initially in 1990. The first match at McDiarmid Park was held against Clydebank in the division one but the real curtain raiser occurred when a full strength Manchester United managed by former St. Johnstone’s player Sir Alex Ferguson played in front of a large 9,780 capacity crowd two months later on October the 17th. The record attendance was set against Rangers two years later in February 1991 which was practically a sell out as the small club from Perth returned to the Scottish Premier Division after winning the 1989/1990 first division title. McDiarmid Stadium is comprised of four stands: North, East, South and West. A good majority of home fans prefer to watch the game from the east stand which contains the family section, however the other remaining stands all have their own section of die-hard supporters. 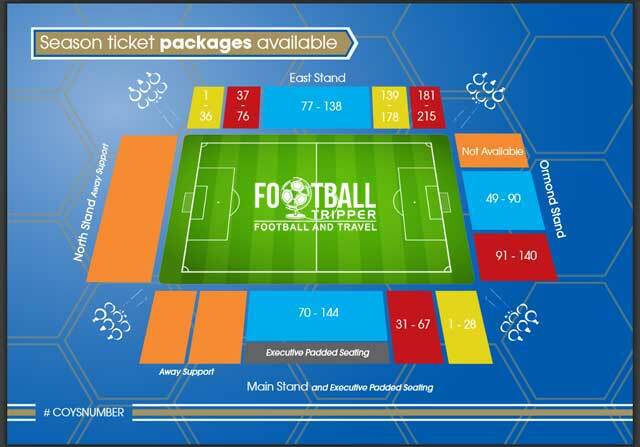 Unless stated before the match or seats have a sticker on them, seating is generally reserved which means you can sit where you wish within your stand. Depending on levels of demand away fans are either housed within the North or West Stand, with the former capable of seating up to 2,000 supporters on any given occasion. The two closest pubs to McDiarmid Park are The Glover Arms located next to the Travelodge Hotel, and The 208 Public house located east of the ground on Crieff Road. Depending on whether or not you have a car, The Maltings at the Holiday Inn Express on Dunkeld Road is also a potential place to grab a pint from. Within the city centre there are at least a dozen potential watering holes with The Foundry, The Sandeman and Royal Bar all representing the classic British boozer. If you fancy something slightly more scenic both The Capital Asset and Greyfriars Bar overlook the River Tay with a decent selection of ale to boot. The city centre has a good mix of independently run places such as The Munchy Box, Maza Indian Buffet and Holdgates Fish Bar, which contrast well with generic chains such as KFC and Pizza Hut. For a slightly more healthy option there’s also a large Tesco located next to McDiarmid Park, although meal-deals are only as healthy as you make them! Inside the ground there are numerous food kiosks located within each stand which offer the expected range of match day grub such as pies, hot-dogs, burgers, sausage rolls, and cold and hot drinks. The club even won a BBC award in 2011 for having the best value pies, so make sure you check them out! The club shop is housed within the Ormond stand facing out towards the car-park, and is only open on matchdays for 90 minutes before kick-off and for around 30 minutes or so after the full-time whistle has blown. As it is hardly a mega-store, it can get quite cramped on matchdays although service is good and fans can purchase official merchandise such as kits from the club’s official online store. 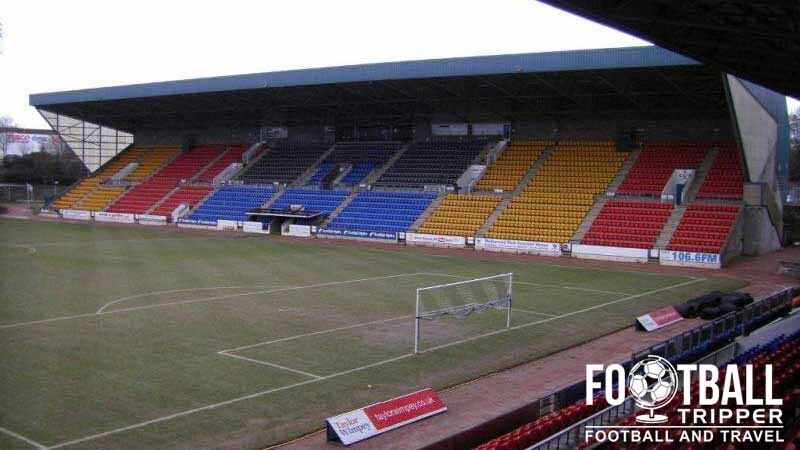 It doesn’t appear as if St Johnstone currently offer fans the chance to undertake a guided tour of the facilities at McDiarmid park, however if this changes we’ll be sure to update this section. St Johnstone Fans can generally be spotted on matchdays in blue colours. With the exception of when McDiarmid Park hosts Celtic, the majority of home matches don’t require you to book tickets in advance, however it is still advisable if you wish to get the best possible seat. The ticket office is open Monday to Friday between 9.00 am to 5.00 pm as well as on matchdays. Please note under 12s can only enter the stadium for free when they are accompanied with a paying adult. McDiarmid Park is located in north-western Perth close to the interchange between Crieff Road (A85) and the A9, approximately 2 miles or so away from Perth city centre. At the ground there is a plentiful car park with room for over 1,000 vehicles which means that it is very rare that you won’t be able to find a space. Parking is also reasonably priced at £5.00 per vehicle, and there are helpful stewards to help guide you to your space. Perth Station is located approximately 2.4 miles south-east of McDiarmid Park, with the resulting journey by foot likely to take the average fan just under 50 minutes. As a lot of the journey is uphill the club personally recommend getting a taxi which costs a tenner and will take you around 10 minutes max. The platforms of Perth Station. If you don’t fancy getting a taxi then you could always stick with public transport and catch either the number 1, 2, 13 and 15 buses will drop you off at Crieff Road right outside the ground. Both cost a few quid for a single journey, and depart from the large bus interchange on Mill Street close to Perth & Kinross Council building. For up to date bus timetable and information please visit Stage Coach Bus. The Travelodge just past the A9 main road is undoubtedly the closest hotel to McDiarmid Park, with the Holiday Inn Express slightly further away to the east also an option. Within the city centre there is also the likes of a Premier Inn and Best Western Queens Hotel which is right next to Perth Railway Station.